Radicchio is a purple leafy vegetable that’s quite bitter. Here it helps balance out the richness of duck meat and rendered duck-skin cracklings. 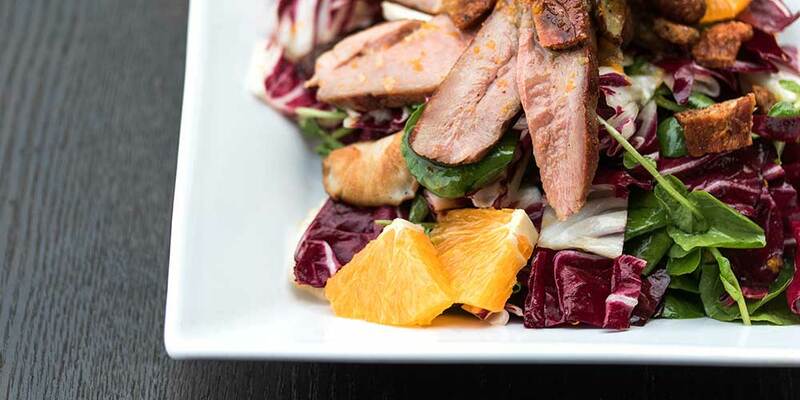 A sweet/tangy/rich ginger, orange & duck fat vinaigrette helps marry these two elements together. Carefully peel the skin (with the fat) off of the breasts in single pieces. Lay the skin in a wide frying pan or skillet & weight down the pieces with an oven-safe plate or pot lid to ensure even contact. Put the pan on the stove over Medium heat until the skin starts to sizzle, turn the heat down to Medium Low. Continue to cook, turning the skin occasionally, until all the fat has rendered out & the pieces have crisped up. Remove the pieces from the pan to a plate with paper towels to drain. Sprinkle the skin with salt. Reserve the rendered duck fat. Pull or cut the stems off the shiitake mushrooms & cut any particularly large caps in half. Scoop 1 tbsp of the duck fat out of the rendering pan into a separate frying pan. Saute the shiitake caps in it until well browned, then move them to a plate. Core the radicchio & cut it into bite sized pieces. Pick the leaves off the watercress stems. Zest two oranges with a fine toothed grater or microplane. Cut them into a total of 8 rounds. Squeeze the remaining orange for its juice. Add two tablespoons of the reserved duck fat into the pan where you cooked the shiitakes. Lay the duck breasts in and sear them, turning every 30 seconds, until they’ve cooked through to an internal temperature of 125°F. Move the duck breasts from the pan to a clean plate. Loosely cover them with foil and let them rest for 10 minutes while you make the vinaigrette. Chop the crisped duck skin into small pieces (small dice). Make the Vinaigrette: In a small bowl, combine the crystallized ginger, orange zest, white wine vinegar, orange juice, salt and mustard. Whisk to combine, then continue to whisk while slowly drizzling in ¼ cup of the reserved duck fat. Whisk any juices that have collected on the duck resting plate into the vinaigrette. Slice the duck breasts and, if desired, cut the orange wheels into wedges (remove the rind). 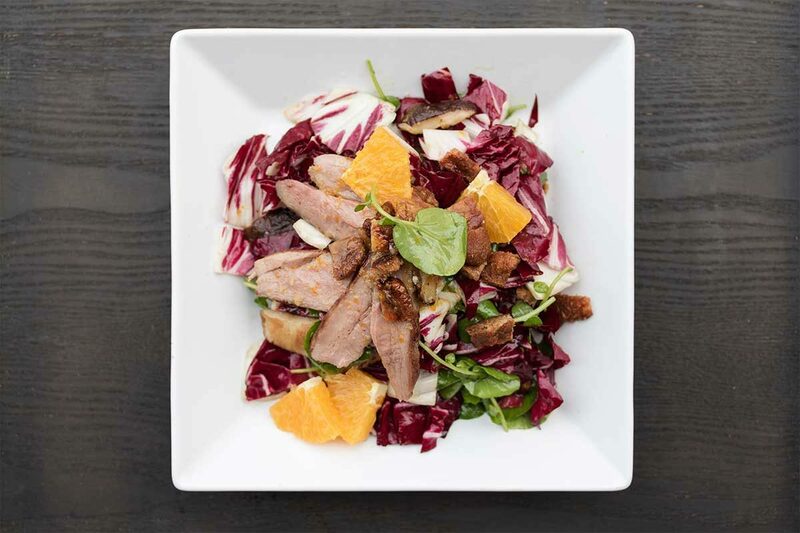 Toss the oranges and duck with the crisped skin, radicchio, water cress and the vinaigrette. Serve.